The Seacoast Shipyard Association's annual impact statement found that the shipyard's contribution to the local economy rose $131 million from the previous year. PORTSMOUTH, N. H. — Portsmouth Naval Shipyard, located on Seavey Island in Kittery, pumped $882 million into the economy in 2018, up $131 million from the previous year. Those who work there say the 219-year-old shipyard has a strong future, with more than enough work to keep the civilian and military workforce busy for the next two decades. As well, they say, there’s been an assurance that some long sought-after projects are in line to be awarded to contractors later this year. In all, the civilian payroll for 2018 was $548 million, and of that, $314 went to Maine workers, $198 million to those from New Hampshire, nearly $16 million to workers who commute from Massachusetts and about $19 million to those who come from other states. That is according to the Seacoast Shipyard Association, an organization that advocates for the shipyard. The SSA produces an annual statement on the economic impact of shipyard and released its report for 2018 on Thursday afternoon during a news conference at Portsmouth City Hall. SSA Chairman John Joyal, who retired after working at the shipyard for 40 years, painted a picture of a strong, skilled and dedicated workforce that makes ship safety a priority. “It is very important employees stay focused on the mission at hand,” he said. SSA Vice Chairman Michael Ralston is a former submariner who served aboard the USS Spikefish and USS Nautilus and later worked at the shipyard. “You’ve got to be on a submarine beneath the ice,” to appreciate the repair and maintenance work done at the shipyard, he said. The annual assessment comes weeks after President Trump indicated he might put money earmarked for military infrastructure projects to building portions of a wall along the border with Mexico, including up to $200 million that would go to projects at the Kittery shipyard. 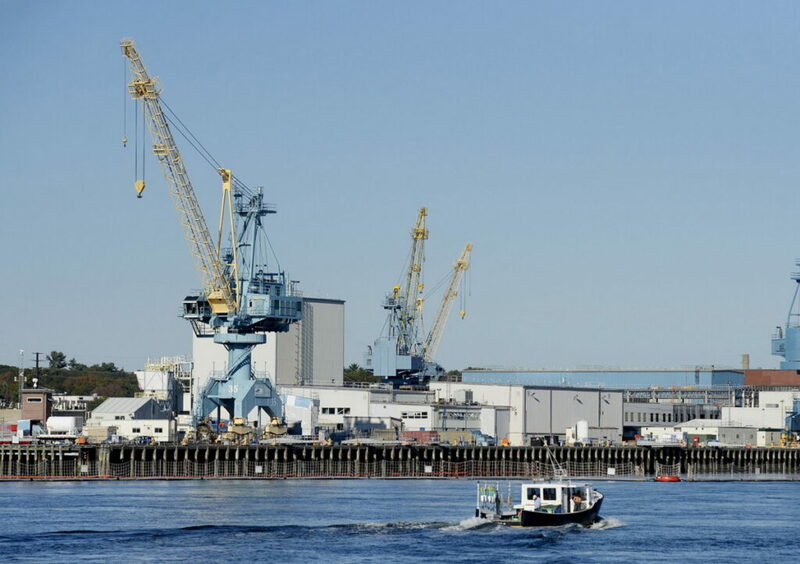 Joyal alluded to but did not specifically address those concerns Thursday, Rick Smith, president of the Metal Trades Council, reported some good news about the shipyard from a meeting with Maine Sen. Susan Collins in Washington this week. Smith said he was reassured that three projects, one to create a super flood basin that would allow an expansion of the existing dry dock to service Los Angeles and Virginia class submarines 365 days a year, a crane rail project and another involving the Defense Logistics Agency were on the president’s desk, awaiting his signature. Collins, in a news release issued Tuesday, said she had questioned Vice Admiral Dixon Smith, the Navy’s Deputy Chief of Naval Operations for Fleet Readiness and Logistics, about the status of the three projects. Collins told the admiral that the projects for which she’d secured $162 million have award dates before Sept. 30. She said Smith responded that the Navy was currently on track to award all three. The navy yard is “very, very busy,” said Joyal, who noted there’s enough work projected to keep the shipyard workforce busy through 2032 and beyond. “There are boats scheduled to be in dry docks we haven’t built yet,” said Bill Webber, president of the American Federation of Government Employees, local 2024. Smith said it is his understanding that the shipyard intends to hire 600 workers this year, through a variety of programs from apprentice to direct hire. The shipyard employed 6,972 civilians in 2018, up from 6,450 in 2017. Of those, 4,234, or 55 percent, live in Maine and earned $314 million. Of the Maine workers, 502 live in Sanford, up from 460 the previous year. The Sanford workers earned $34.5 million in 2018. According to SSA, there were 404 workers from Berwick, 403 from Kittery, 371 from South Berwick, 292 from Lebanon, 219 from Wells, 196 from Biddeford, 127 from Saco, with 97 from Kennebunk, and fewer from other communities. In addition to the civilian payroll, the military payroll topped $44 million, the shipyard purchased $120 million in goods and services, and spent $169 million in contracted facility services. Joyal emphasized the teamwork at the shipyard, and urged the congressional delegations of Maine, New Hampshire and Massachusetts to hone their focus on the navy yard and to reach across the aisle to assure continued funding.